It was an innocent elementary class field trip to the Ann Arbor Natural History Museum. Jurassic Park had just come out, and my classmates were beside themselves with excitement about the dinosaur bones on the first floor, and the endangered and extinct animals on the following floors. 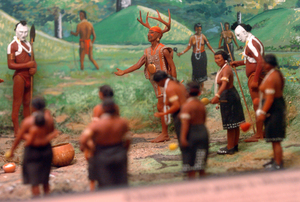 Finally, we arrived on the fourth floor – and surrounding our class was a wall of dioramas depicting Native American people. A few included some Michigan tribes like my own – the Ottawa. Lingering for some time in front of the exhibit, we walked over to the Ottawa diorama, and I turned to my classmate, pointing at the small figurines: “I’m Ottawa, like these people!” I said proudly. “You can’t be Indian! Indians are extinct!” my classmate retorted back, matter-of-factly. At the time, I was more upset over being called a liar. Because I knew I wasn’t lying. I grew up knowing full-well my heritage and my culture. It wasn’t until telling the story to my mother at home later that day, and more clearly now as an adult, that I saw this interaction as part of a bigger problem. Looking back, I don’t blame my classmate for thinking I was extinct. The child just saw three full floors of dinosaur bones and extinct animals. Why else would those plastic figurines be placed behind a glass exhibit? My story is not unique in Indian Country, and is one of many instances I’ve experienced growing up (and as an adult) where my mere existence befuddled the minds of larger America. Like the time during the end of my senior year in high school where a classmate asked if I was Native American. I replied I was. His next question: “Did you grow up on a reservation?” I almost laughed out loud. I’d gone to school with this guy since preschool and lived just a few blocks away from his home since we were both age three. In this instance, sound logic was incapable of overriding the dominant perception of who I was supposed to be, and where he was taught I was supposed to live. As we have this conversation about racial equity, we need to stop and pause to understand how problematic the portrayal of Native American people in dominant society has been. One of our largest hurdles in our fight for racial equity and social justice is visibility – to simply exist in the minds of general society as living in 21st century. For example, when I give presentations on Native Americans, my first question to the students is, “Picture a Native American in your head. What do you see?” I almost always get back: Squanto. Pocahontas. Tomahawks. Feathers. Headdresses. Teepees. Chief Wahoo. I then ask how many pictured me, or any Native American who is still alive. You could cut through the silence with a knife. Stereotypes are a powerful thing. And for Native American people, we are perpetually stuck in the 1880s, clad in buckskin and feathers. We aren’t your neighbors, doctors, or coworkers in 2019. Information from movies, television, the media, and sports mascots has created a false narrative about historic and contemporary Native Americans. Even when teaching history in schools, Native Americans – despite being here during the entirety of the formation of the United States, and one of the largest influences in its formation – we only show up a handful of times in lesson plans. 40% of respondents didn’t think Native Americans still existed. Two-thirds of respondents said they don’t know a single Native person. Only 59% agreed the United States committed genocide against Native Americans. 36% of those surveyed firmly believe they have some Native American ancestry (despite the fact that Native American people are less than 2% of the population). Teachers and parents in focus groups found school curriculum covering Native Americans to be inaccurate and that Natives are under-represented. Most lumped all Native Americans into one group instead of recognizing tribal differences. Invisibility and erasure undermine current efforts of over 570 separate, sovereign, and modern tribal nations – each with our own languages, culture, and ways of life. Native Americans comprise just 1.5% of the population nationally. It is exceedingly difficult to challenge misconceptions and stereotypes when the average person is unlikely to interact with Native American people day-to-day. But 98,700 people who are either exclusively or partly Native American call Ohio home and 28% of this population lives in Greater Cleveland. Challenging the dominant false narrative is especially difficult in Ohio, which is one of just a few states in this country that has zero federally recognized tribes. And it shows. Today, Ohio is home to the second largest concentration of stereotypical Native American sports mascots. This concentration is almost exclusively found in states, like ours, with no recognized tribes. During this 21-day racial equity challenge, my call to you is to think about Native American people beyond the stereotypical imagery. Because Native Americans are such a small segment of the population, and because odds are we won’t be at every single table to dialogue on this matter – we require informed allies. If you consider yourself an ally, this resource from Reclaiming Native Truth is a fantastic place to start. For parents, ask your child’s school about their curriculum around Native American people. Make sure Native people are not discussed only in a historical context, but also through a modern lens. Push back when asked to dress up and “play Indian.” Ask how your teachers are incorporating modern Native artists, authors, and contributions in their year-round lessons, rather than just around holidays like Thanksgiving. Check out this blog with book recommendations by indigenous authors for all reading levels to read at home, or to suggest for school. 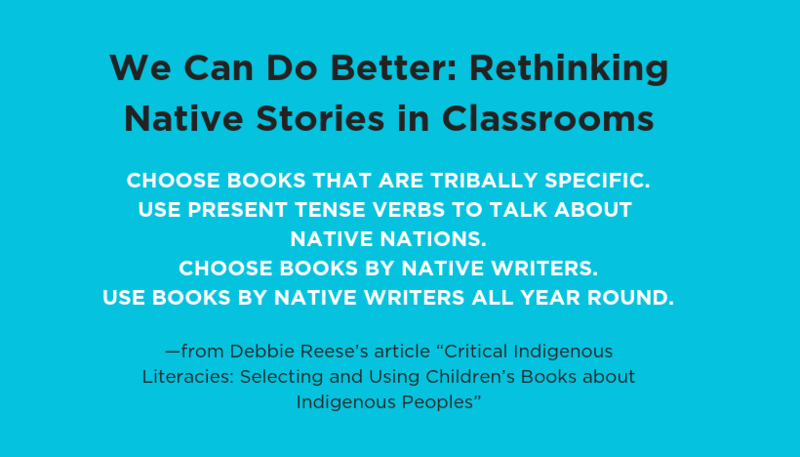 Or this website with recommendations & a useful infographic (see above) on how to incorporate Native American literature year round in the classroom, and in your own home. Think about how Native people are represented in your life, if at all. And begin to take active steps to change the harmful dominant narrative to be more inclusive, and portray Native people in the 21st century – like my family – who by the way, are definitely Indian, and not extinct. Cynthia Connolly and her family. Cynthia Connolly grew up in Detroit and is a citizen of the Little Traverse Bay Bands of Odawa Indians located in Northern Michigan. She moved to Cleveland in 2007 and serves as the Development Director at Policy Matters Ohio, a nonprofit policy research institute. 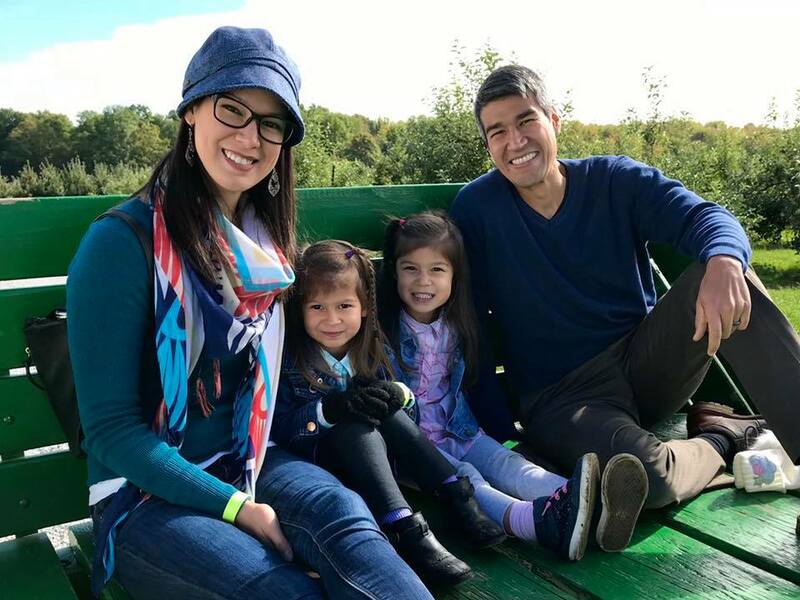 Cynthia also serves on the executive board of the Lake Erie Native American Council and works as a lecturer at Kent State University, teaching the Native American studies course. Cynthia earned her Master of Public Administration from Cleveland State University; and a Bachelor of Arts in American Culture and Native American Studies from the University of Michigan.